Kimberlee Auerbach is a performer, teacher and author of The Devil, The Lovers & Me: My Life In Tarot (Dutton 8/07). Her one-woman show, which inspired her memoir, played to sold-out houses in NYC. She teaches memoir writing at Mediabistro, creative writing at Gotham Writers Workshop and counsels 8th grade girls at Liberty LEADS at Bank Street College of Education. John Wray was recently named one of the twenty best young American novelists by Granta magazine. His new novel, Lowboy, will be published by Farrar, Straus & Giroux on March 11th. Jessica Milton is a contributor and managing editor of Hex Ed. Journal. She spends her time playing in The Peter Penguid Society and Dirty Circles, drawing pictures, and watching the world around her. Theo Gangi is the author of Bang Bang (Kensington), a New York City based crime novel. His stories have appeared in The Greensboro Review and The Columbia Spectator. His articles and reviews have appeared in The San Francisco Chronicle, Inked Magazine and Mystery Scene Magazine. His second novel, Twist the Trees (Kensington) will be released in 2010. Knox Dupree has held many titles: poet, journalist, club manager, common thief, politician, accountant, filmmaker, fireman, scholar, stuntman, hobo, scientist, among others. The one he most prefers is ‘human’, because if he has learned anything in his travels, it is that I am weak. In the immortal words of Sammy Cahn, “I fall in love too easily, as a result, I suffer from near constant heartbreak.” He is the author of The Heartbroke Daily. 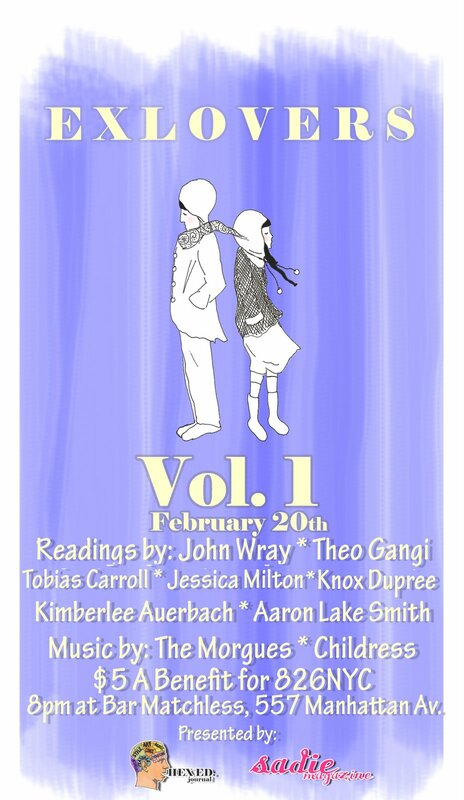 Tobias Carroll’s short stories have appeared in THE2NDHAND, 3:AM, Word Riot, and Featherproof Books’ “Light Reading” series. He has written about music and/or books for the Portland Mercury, Death + Taxes, Paper Thin Walls, Lit Mob, and others, and is presently at work on a novel. He maintains a website at www.thescowl.org.